Most of the "real" secret stuff doesn't go up in rockets anymore. Rockets make great big noisy decoys while keeping the other military "toys" hidden from public view and scrutiny. We humans are so easy to please, throw an old bone out every now-and-then to gnaw on and keep people satisfied and pacified, works every time. "They" whistle and the media eagerly comes, waging its tail, ready and eager to bring out the so-called news to keep the masses "enlightened". "We've just seen the successful liftoff" of the rocket, launch commentator Don Spencer said in a webcast. The reconnaissance office, which oversees the nation's constellation of spy satellites, has kept mum about the purpose of the mission and directed United Launch Alliance to cut off the live broadcast three minutes after liftoff. Intelligence analysts think the rocket carried a radar imaging satellite capable of seeing at night and through bad weather. In recent years, the United States has worked to phase out its fleet of older, heavier radar reconnaissance satellites with smaller but equally capable ones, said Charles Vick, a space policy analyst with the Globalsecurity.org think tank. Such radar satellites would be able to zero in on countries of interest and see details that typical Earth satellites can't, experts said. Tuesday's launch involved reconfiguring the rocket to add on two strap-on boosters to provide more thrust. The protective nose cone enclosing the payload also had to be made larger. 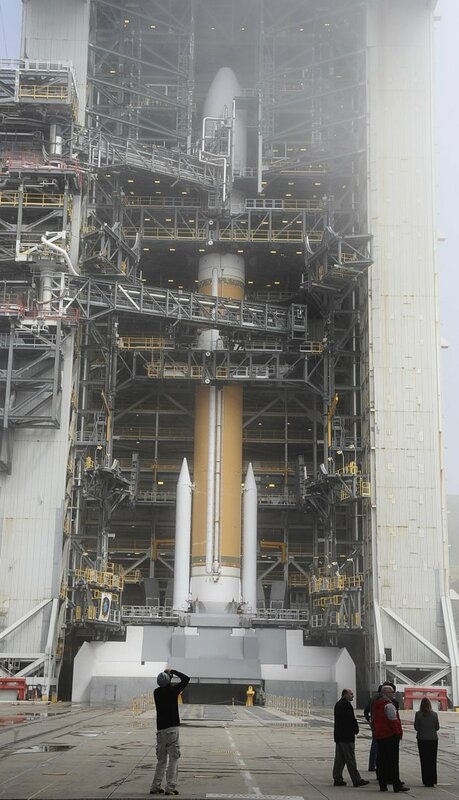 ULA, the joint venture of rocket builders Lockheed Martin Corp. and Boeing Co., said it was the first time the Delta IV had been launched this way. The launch was delayed nearly a week as engineers worked to fix an issue with the upper stage engine. The next launch out of Vandenberg will be a flight test of the Minuteman III on April 10. I am not satisfied with the bone. These 'bones' they throw out dont impress me. I believe that the Delta IV's are man-certified and that there maybe 3 or 4 astronauts in this one. Man certified rockets also include Sea-Launch and 2 others.